The Coat o Airms o the Philippines features the aicht-rayed sun o the Philippines wi each ray representin the aicht provinces (Batangas, Bulacan, Cavite, Manila, Laguna, Nueva Ecija, Pampanga an Tarlac) which wur placed unner martial law bi Governor-General Ramón Blanco durin the Philippine Revolution, an the three five-pointit starns representin the three primary geographic regions o Luzon, Visayas, an Mindanao. In the blue field on the left side is the Eagle o the Unitit States, an in the reid field on the richt is the Lion-Rampant o Spain, baith representin colonial history. The design is vera seemilar tae the design briefly adoptit bi the Commonweel o the Philippines in 1940. It is an aa uised bi the Philippine National Bank. The naitional coat o airms wis adoptit, pursuant tae Commonweel Act No. 731, which wis approved on Julie 3, 1946. The coat o airms wis designed bi Captain Galo B. Ocampo, secretary o the Philippine Heraldry Committee. Paleways o twa (2) pieces, azure an gules; a chief argent studdit wi three (3) mullets equidistant frae each ither; an, in point o honor, ovoid argent ower aw the sun rayonnant wi aicht minor an lesser rays. Beneath shall be the scroll wi the wirds "REPUBLIKA NG PILIPINAS," inscribed thereon. The wirds on the scroll hae unnergane mony chynges syne Philippine unthrildom. Frae unthrildom in 1946 till 1972, when Preses Ferdinand Marcos declared martial law, the scroll contained the wirds "REPUBLIC OF THE PHILIPPINES." Frae 1979 till the owerthrow o Marcos in 1986, the scroll haed the wirds "ISANG BANSA ISANG DIWA" ("Ane Naition, Ane Spirit") inscribed. Efter the owerthrow o Marcos, the scroll chynged tae the current "REPUBLIKA NG PILIPINAS". On Februar 12, 1998, wi the approval o Republic Act No. 8491, the eagle an lion on the lawer hauf o the shield wur no specified, an therefore removed. Housomeivver, the modified airms are no in wide uise, pendin the ratification o the law bi a naitional referendum cawed for that purpose, as mandatit bi the Philippine Constitution. Early version o the coat o airms o the Philippines that the scroll written in Inglis as "REPUBLIC OF THE PHILIPPINES", is uised in govrenment invoice, govrenment institution seals (especially the Bureau o Immigration), markins in govrenment-awned public vehicles fundti bi representatives, seals o the municipalities an (component) ceeties, an for uise o embassies an consulates (or internaitional version o Philippine coat o airms). The shade o azure wis navy blue, as an' a' suitit wi the Banner o the United States. Historically, the airms o Castile an Leon is the ryal representation o the Philippines tae the ryal court o Spain. But the Spainyie-descendit Filipinos wur proud that these twa airms wad represent Philippines. Coat o airms o the Spainyie East Indies (1565–1899). Airms o the Commonweel o the Philippines (1939-1946). Seal o the Vice Preses o the Philippines..
Seal o the Senate o the Philippines. Seal o the House o Representatives o the Philippines. Seal o the Supreme Court o the Philippines. 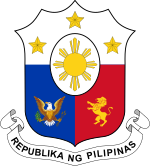 ↑ "House of Representatives of the Philippines - Audience: Students - The National Coat of Arms". Retrieved 2008-12-14. ↑ "Chan Robles Virtual Law Library - Republic Act No. 8491". Retrieved 2010-11-10. This page wis last eeditit on 4 Januar 2018, at 09:20.